Gorgeous 14-inch and 15-inch thin and light laptops featuring stunning frameless NanoEdge displays for near-borderless visuals. Ultra-portable: The ZenBook 14 (UX433) is the world’s most compact laptop – made possible by ultra-slim four-sided “NanoEdge” displays. Touch the future: Exclusive new “NumberPad” on ZenBook 14 (UX433) and ScreenPad™ on ZenBook Pro 14 (UX480) to boosts productivity, and a 3D IR camera allows fast face login, even in low-light environments. Ultimate comfort: “Ergolift” hinge raises keyboard at the rear for comfortable typing; it also improves cooling and audio performance. Extreme performance: Superb performance with latest 8th Gen Intel® Core™ processors, up to NVIDIA® GeForce® GTX 1050 Max-Q graphics, 16GB RAM, PCIe SSDs and gigabit-class Wi-Fi. SINGAPORE (14 December 2018) — ASUS today announces an all new ZenBook series, comprising of the ZenBook Pro 14 (UX480), ZenBook 14 (UX433) and ZenBook 15 (UX533). This is the series of premium thin and light laptops that introduces the stunning new frameless NanoEdge display, which features ultraslim bezels on an unrivaled up to 92% screen-to-body ratio for a near-borderless viewing experience. The NanoEdge display also allows for a much more compact design. In conjunction with the unveiling of the all new ASUS ZenBook series, ASUS has collaborated with seven talented Singaporean artists to create original art pieces for the exhibition, “COLLISION”: Unleash Your Creative Power. This open-to-public art exhibition happening from now till 16 December, 2018 at The Luxe Art Museum will showcase a variety of mixed-media artworks, which are all inspired by the latest advancements from the ASUS ZenBook. The exciting line-up includes the imaginative and delightful embroidery by Embroidery Artist Teresa Lim; ethereal paper florals installation by Paper Artist Dawn Koh; whimsical and vibrant photo series by Photographer Daryl Aiden Yow; conceptual ergonomic cat sculpture by Multi-disciplinary Artist Jalon Tan; illustrated fantasy (on wall) by Art-Design Duo Ripple Root; experimental sound installation by emerging artist, Goh Abigail, and fun and quirky doodle art by popular doodling group, Band of Doodlers. Through these artistic creations, the limitless abilities of the ASUS ZenBooks, and its seamless compatibility with the lifestyle of modern creatives, are explored. The ScreenPad™ cleverly combines a touchpad with a high-resolution, full-colour touchscreen to offer novel ways of interacting intelligently with both Windows apps and dedicated programs called ScreenPad™ Apps. Adaptive functions with context-sensitive tools enhance workflow and productivity, and ScreenPad™ is fully customizable to allow users to personalise their experience. A highly mobile alternative to the 15.6-inch ZenBook Pro 15 (UX580), the ZenBook Pro 14 (UX480) delivers extreme performance in a slim, lightweight and supremely elegant package. Powered by the latest 8th Generation Intel® Core™ i7-8565U processor with 16GB RAM, NVIDIA® discrete graphics, and the fastest 512GB PCIEG3x2 NVME 512G M.2 SSD, the ZenBook Pro 14 (UX480) is designed to handle the most demanding tasks with ease. Comprehensive connectivity includes gigabit-class 802.11ac Wi-Fi, USB-C™ 3.1 Gen 2, USB 3.1 Gen 2 Type-A, and standard HDMI output. The elegant all-aluminum design features the exclusive ErgoLift hinge, which automatically tilts the keyboard for comfortable typing, and a prestigious Deep Dive Blue and Rose Gold colour scheme. Its ultra-compact dimensions are enabled by the 14-inch NanoEdge Full HD display, with ultraslim bezels that provide an expansive, distraction-free viewing experience. The display is also PANTONE® Validated for superb colour accuracy. The ScreenPad™ is a Windows Precision Touchpad (PTP) combined with an interactive 5.5-inch Full HD touchscreen that offers a revolutionary new way to work with a laptop. The ScreenPad™ has helpful functions that can intelligently adapt to match whatever the user is doing, making it easier and quicker to multitask and get things done. A simple press of the F6 function key toggles the ScreenPad™ between touchscreen mode, touchpad mode and Screen Extender mode. The ScreenPad™ can be used in several different ways. Special dedicated ScreenPad™ Apps run within ScreenPad itself, with a variety of useful tools including Calculator, Music Player, NumKey, Launcher and ASUS Sync. Launcher allows users to open or switch between desktop apps via user-customizable shortcuts, and ASUS Sync provides integration with smartphones running the free ASUS Sync app. NumKey turns ScreenPad™ into a handy numeric keypad for data entry. Screen Extender mode allows ScreenPad to be used as an extension to the main display, further aiding multitasking and productivity. Selected desktop apps — such as Microsoft Word, Excel, PowerPoint — offer even closer integration with the ScreenPad™, with adaptive menus and editing controls on the ScreenPad™ that change automatically according to the app and what task is being performed. With the ScreenPad™, workflow efficiency is enhanced for better productivity. Another innovative form of adaptive ScreenPad integration is via browser extensions, such as the ScreenPad™ Online Video Player: this puts video playback controls for YouTube videos at the user’s fingertips. Live updates ensure the ScreenPad™ is always running the latest version, and new apps can be downloaded from the Windows Store. Packed with state-of-the-art components, the ZenBook Pro 14 (UX480) delivers the ultimate on-the-go performance for discerning professional users. It is powered by up to the latest 8th Generation Intel® Core™ i7 processor, with 16GB of high-performance 2400Hz DDR4 RAM and PCIEG3x2 NVME 512G M.2 SSD for ultrafast performance that lets the ZenBook Pro 14 (UX480) boot instantly and open apps in a heartbeat. The ZenBook Pro 14 (UX480) uses the latest gaming-grade NVIDIA® GeForce® GTX 1050 Max-Q GPU for maximum performance in an energy-efficient design. Perfect for on-the-go designers, developers or gamers, this visual prowess means they will always enjoy the smoothest possible graphics performance. Despite its incredible performance, the ZenBook Pro 14 (UX480) offers full-working-day battery life, with up to 12.5 hours* on a single charge. Gigabit-class 802.11ac Wi-Fi lets users enjoy smooth streaming of online videos, with greater range and more stable network connections. *Battery life might vary from different usage. Elegance, sophistication and precision craftsmanship are the hallmarks of every ZenBook. The prestigious Deep Dive Blue and Rose Gold colour scheme chosen for the ZenBook Pro 14 (UX480) is luxuriously stylish without being brash. For ergonomic comfort, it goes the extra mile with its exclusive ErgoLift hinge, an engineering masterpiece designed to automatically tilt the keyboard to the most comfortable typing position. But that is not all: the carefully calculated tilt improves cooling and audio performance, too. The NanoEdge Full HD ultraslim-bezel display on the ZenBook Pro 14 (UX480) is truly awe-inspiring, with an impressively thin 5.2mm bezel and 86% screen-to-body ratio. It is gorgeous for everyday use, with incredible pin-sharp detail and bright, vivid colourus for more lifelike images. With a wide 100% sRGB and 72% NTSC colour gamut, this PANTONE Validated display provides professional-grade colour performance. The built-in ASUS Calibration Technology provides colour-accuracy tuning and uniformity compensation to make things easy when it is time to recalibrate the display’s brightness and colour consistency, making the ZenBook Pro 14 (UX480) a graphics professional’s dream. The new ZenBook 14 (UX433) and ZenBook 15 (UX533) are one of the world’s most compact laptops for their respective display sizes, and come dressed in elegant Royal Blue colour. The most compact model, the ZenBook 14 (UX433), is smaller than an A4 paper. The lids of the new models feature the swirling concentric circle pattern that has been a hallmark of the ASUS ZenBook series. On the inside, the laptops feature colour-matched backlit keyboards – gold lighted keys for the Royal Blue colour laptop and the keyboard frame features an elegant Rose Gold deco bar accenting its top edge. Crafted from the strongest aerospace-grade aluminum, the new ZenBook 14 (UX433) and ZenBook 15 (UX533) are not just beautiful, but also extremely strong and durable, having passed the demanding MIL-STD-810G military standard for reliability and durability. Rigorous tests to pass the standard include environmental extremes of altitude, temperature and humidity, in addition to extensive drop, shock and vibration testing. The ZenBook 14 (UX433) and ZenBook 15 (UX533) feature an “ErgoLift” hinge that automatically tilts the keyboard up at the rear when the laptops are open, to create a comfortable typing angle. This also creates an air gap at the bottom of the laptop that helps in dissipating heat and improves audio by acting as an echo chamber. The new ZenBook 14 (UX433) and ZenBook 15 (UX533) feature displays that have ultra-narrow frame bezels that we call the “NanoEdge” displays. These narrow display frame bezels allow displays to be fitted into a smaller laptop body and are the secret behind the compact sizes of the laptops. Ultra-compact laptop keyboards typically do not have enough space for a dedicated number pad. To solve this issue for the ZenBook 14 (UX433), they are equipped with the exclusive new ASUS NumberPad. As the name implies, the NumberPad is a dedicated number pad that appears on the touchpad of the smaller ZenBook models. Tapping the NumberPad icon at the top right corner of the touchpad reveals a full-size LED-illuminated numeric keypad, allowing rapid and intuitive data entry or calculations. A top view of the keyboard area of a ZenBook 14 (UX433) showing the colour-matched keyboard backlighting, the gold deco bar on the keyboard frame’s top edge, and the innovative new LED-backlit NumberPad on the touchpad. The ZenBook series has always been about balancing its incredible beauty with unbelievable power, and the new ZenBook 14 (UX433) and ZenBook 15 (UX533) are no exception. The new models feature a full complement of the best high-performance components including the latest 8th Generation Intel® Core™ i7 quad-core processors, up to NVidia GeForce GTX 1050 Max-Q graphics, 16GB RAM, ultrafast PCIe SSDs and the fastest available gigabit-class Wi-Fi. The displays of the new ZenBooks have Full HD resolution, and with their ultra slim display frame bezels, they deliver a more immersive viewing experience with less visual distraction, making them the perfect choice for on-the-go creativity or entertainment. Mobile professionals need to stay connected — at the fastest speed possible. The ZenBook 14 (UX433) and ZenBook 15 (UX533) feature gigabit-class Wi-Fi and ASUS Wi-Fi Master technology, for ultrafast downloads and smooth streaming with greater range and more stable network connections than ever before[i]. Additionally, the latest Bluetooth® 5.0 lets users access all the benefits of the latest low-power peripherals and accessories. Designed for non-stop, on-the-go lifestyles, the new ZenBook series gives users the freedom to work all day on a single battery charge — up to an impressive 14 hours for ZenBook 14 (UX433)[ii], and an incredible 16 hours for ZenBook 15 (UX533)[iii]. When working on the go, it is vital to be able to connect with anything and everything. 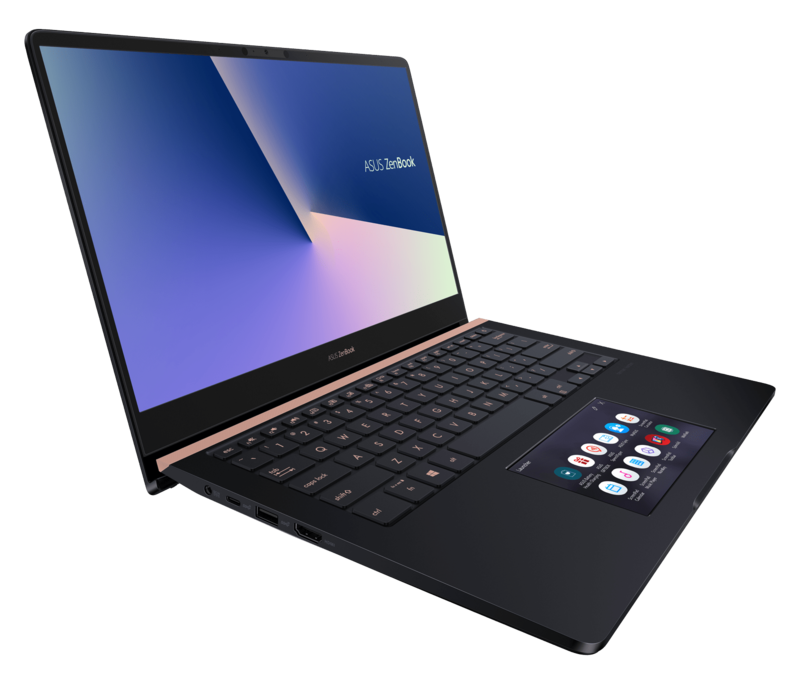 Despite their compact sizes, the new ZenBook 14 (UX433) and ZenBook 15 (UX533) feature a wide array of connections including the revolutionary USB Type-C port for any-way-up connections and superfast USB 3.1 Gen 2 (up to 10Gbps[iv]) data transfers, and there is also a range of other USB ports, including USB Type-A (up to 5Gbps or 10Gbps) and/or USB 2.0[v]. All models also include a full-sized HDMI port and a microSD or SD card reader, so it is easy to connect to all your current and future peripherals. The ZenBook 14 (UX433) and ZenBook Pro 14 (UX480) will be retailing from $1,598 and $2,998 respectively starting from today, while the ZenBook 15 (UX533) will be retailing later in 2019 at $2,098. All models will be available at ASUS Brand Shop Bugis and all authorised retailers. [i] Wi-Fi Master test configuration: under controlled test conditions, streaming Full HD YouTube videos, and AP set with one antenna at 802.11g. Actual Wi-Fi range and performance may be affected by environmental factors. Interference from USB 3 devices may vary according to the device. Range comparisons refer to standard laptop with all-metal chassis design. [ii] Battery life test configuration for ZenBook 14: Intel® Core™ i3-8145U, 8GB RAM, Full HD display, 256GB PCIe® SSD. Battery tests conducted by ASUS in August 2018 using the MobileMark® 2014 Office Productivity scenario. Test settings: Wi-Fi enabled, display brightness set to 75%. Actual battery life may vary depending on product configuration, usage, operational conditions and power management settings. Battery life will decrease over the lifetime of the battery. [iii] Battery life test configuration for ZenBook 15: Intel® Core™ i5-8265U, 8GB RAM, NVIDIA® GeForce® GTX 1050 Max-Q discrete graphics, Full HD display, 256GB PCIe® SSD. Battery tests conducted by ASUS in August 2018 using the MobileMark® 2014 Office Productivity scenario. Test settings: Wi-Fi enabled, display brightness set to 75%. Actual battery life may vary depending on product configuration, usage, operational conditions and power management settings. Battery life will decrease over the lifetime of the battery. [iv] Unless otherwise stated, claimed USB speeds are based on theoretical performance. Actual performance may vary in real-world situations. [v] I/O ports vary according to model, please refer to individual model specifications for details.